Secure transportation becomes more challenging especially when systems need to move their data to the cloud and to other systems which in most cases are not sharing the same security permission levels. Furthermore, data need to migrate based on complex criteria in different formats and be optimized in order to support safe transportation of huge amount of data in short time. Whether we’re working on small or large scale network, our goal is to provide secured and flexible infrastructure to enable enhanced capabilities of data filtering, data preparation, data manipulation and data shipment in simple way and with cost effective solution. Each component can be configured so that it is possible to enable or disable features without the need for code changes. T-Sense implements scalable architecture and supports tens of gigabits per second of network traffic for real-time stream processing and transportation. 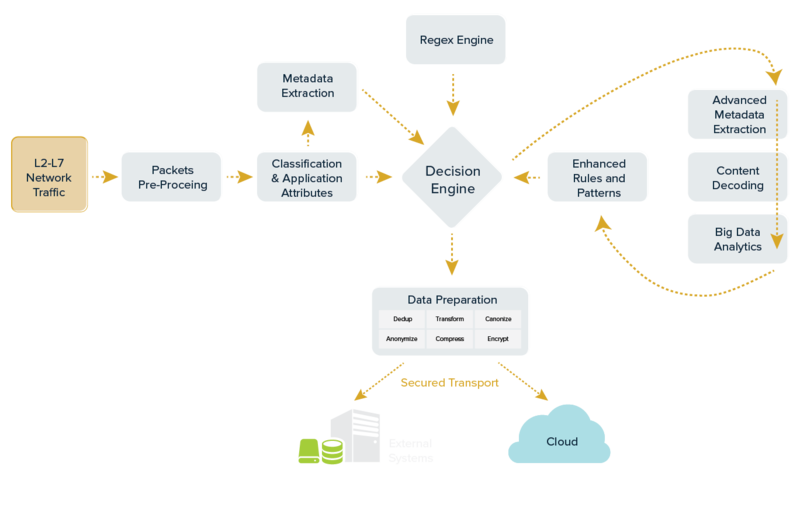 The classification engine includes pattern matching and behavioral, heuristic and statistical analysis to detect applications and client service functionality such as audio, video or file transfer in order to classify them and let the decision engine to filter the stream based on classification group types as well as filtering by specific application. The classification engine also able to extract application based metadata from IP traffic in real-time while providing insights about user behavior and application usage. This information can be used as additional filtering channel and provides detailed understanding of network transactions and behavior for deeper insights and better decisions making. The Decision Engine gets continuous network streams and includes filtering mechanism based on multi-channel criteria while supporting large sets of regular expression with high scanning performance. New rules and patterns can be defined in the decision engine as a result of big data analysis and extraction of valuable data from the decoded application content. The Data Preparation layer is responsible for all data manipulation and preparation for secure and reliable data shipment providing rich capabilities such as deduplication, transformation, aggregation, encryption and so on. With the growth in cloud computing and mobiles data, organizations have to priorities their data traffic and replicate the data efficiently between multiple services deployed in the cloud as well as on-premises.